When scientists first started trying to categorize life forms, they thought about plants and animals. Plants generate energy from the sun in photosynthesis and cannot move. Animals move but cannot conduct photosynthesis. Then yeast were discovered. Yeast, or the kingdom Mycota, a represented in fungi, mushrooms, and other forms that are part of the decomposing of life. Yeast generate enzymes to digest nearly any molecule on earth. Hence, yeast are at the top and the bottom of the food chain. Mushrooms have always been one of natures gifts that people dealt with on strong hate or like it basis as a preferred food material. But the fact is eating mushrooms is so ancient, it is written about in the walls of temples in ancient Egypt, and it seems it was liked so much by some ancient monarch that he declared it forbidden to the public to ensure he gets his mushrooms whenever he felt the urge. Mushrooms are very rich in proteins and fibers and can be used as an excellent animal protein replacement for vegetarians, and if you are not a vegetarian, it is the perfect companion to most meat rich dishes, ask the French if you don’t believe me. While there are over 5 million species of fungi, there around 2000 different types of mushrooms and around 300 are edible without problems to humans unless you are allergic to them of course. But you might only know of the 10 commercially accessible ones like the button mushrooms, chanterelle, portabella, shiitake, oyster, cremini, porcini, and truffles. Unless you are an expert, foraging for mushrooms is not recommended since some mushrooms, like Death Cap (amanita), and extremely lethal. Yet being a rich food material for its nutrient value is not the only good thing for your health that you can get from mushrooms. in fact, the value of mushrooms to your overall health is so great, that after you finish reading this article, you will have it as a constant addition to your diet. This was proven by a study published in the journal Experimental Biology and Medicine in 2010 tested five types of mushrooms (maitake, cremini, portabella, oyster and white button). The study stated that they significantly reduced the incidence of breast cancer by suppressing breast cancer cells growth. The study concluded that some mushrooms might have chemoprotective against breast cancer. But of special interest is the shiitake which is containing a kind of sugar molecule called lentinan which might aid in decreasing the side effects of chemotherapy thus elongating the lives of people under chemotherapy and intaking it. In fact, since 1985 it was used in Japan as an adjuvant in stomach cancer, because according to the Memorial Sloan Kettering Cancer Center “Lentinan does not kill cancer cells directly. Instead, it enhances the immune system, which may aid in slowing the growth of tumors. Lentinan also kills viruses and microbes directly in laboratory studies”. Aside from lentinan mentioned above, mushrooms contain selenium which had been proven to boost the production killer T-cells which fight off infections. And the beta-glucan which is found in fungi cell walls also has a powerful effect of boosting the immunity and even killing tumor cells. Because mushrooms are rich in fibers, which is a very beneficial element of food for people with high blood glucose levels, they are recommended to be part of the foods consumed by either type 1 or type 2 diabetes patients. 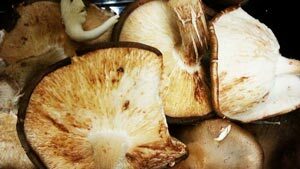 Around a cup of mushroom contains around 3 grams of fibers, and the daily recommended intake quantity for diabetes patients is around 30 grams, so mushrooms plus other fiber-rich foods are always recommended. Again because of the fiber content plus the vitamin C and potassium present in mushrooms, intake of mushrooms helps to maintain the health of the heart. Intake of foods rich in potassium and low on sodium helps to regulate your blood pressure, which is the case with mushrooms. And again, beta glucans have the added effect of lowering down your cholesterol, which is also good for your heart. Antioxidants help to eradicate free radicals from your system, and free radicals are believed to be on the main reason we have cell aging. So, foods that are rich in antioxidants have the effect of giving you’re a longer lifespan plus they will maintain the health of the skin and hair cells, and this gives longer youthful looks, sounds great and it is true. Mushrooms are very rich in antioxidants, which places them as a longevity food source. Besides the fact that they are rich in fibers, antioxidants, and rare elements, mushrooms act as prebiotics which means that they maintain the health of your beneficial bacterial flora in your gut. This helps in digestion and decrease the symptoms of irritable bowel syndrome for people suffering from the disease. Because of the high protein and fiber content of mushrooms, they help to satiate your appetite and decrease the amounts you eat in general. This helps to balance your weight and can even be used in diets without having to feel the starvation hunger pains. One of the powerful antioxidants in mushrooms is ergothioneine, which also acts as a natural anti-inflammatory. Because of this effect, mushrooms have been used for thousands of years in traditional Chinese medicine to lower down the inflammatory effect of chronic inflammatory diseases like most autoimmune dieases. Especially after you pass the point of middle age since mushrooms are very rich in vitamins B and D. vitamin D is an essential element for calcium depositing in the bones, and as we grow older our bodies capabilities to produce this vitamin directly decreases and mushrooms are the richest non-animal source of vitamin D. Take your fresh mushrooms from the store, slice them, and place them in the sun for a day; which will create a super source of vitamin D.
Vitamin B complex is beneficial to almost everything about your health, from blood cells production to the integrity of the nerves to maintaining the beautiful luster of your hair and nails. World-renowned mycologist Paul Stamets discussed how mushrooms can potentially solve some of our most pressing and serious problems in his TED talk. Stamets stated that mushrooms can help with oil spills, absorb pollution, enrich the soil for farming, combat crop harming insects among other actions that mushrooms can be helping with to save the future of our planet. So, it would be good for the health of our future children and their children indirectly as well as directly. Consider adding mushrooms to your diet and enjoy the many health benefits. Thanks you for your up to date info on nutrition for cancer! My son has cancer and I am trying to provide him with the best possible nutrition. Very sorry to hear about your son. I do hope this information can benefit both of you.